Marc B.M. Bracke and Paul Koene, 2019. Expert opinion on metal chains and other indestructible objects as proper enrichment for intensively-farmed pigs. PLOS ONE. Available at http://journals.plos.org/plosone/article?id=10.1371/journal.pone.0212610. EC Directive 2001/93 requires that all pigs have access to proper investigation and manipulation materials. 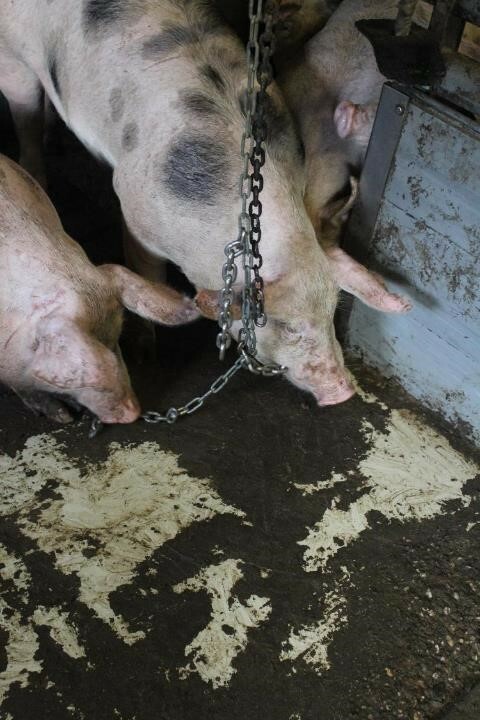 Intensively farmed pigs in Europe are frequently provided with a short/bare metal chain with or without an indestructible object attached to the chain. To date authorities are regarding this as proper enrichment. However, it has become increasingly clear that the chains do not provide proper enrichment, and that adding an indestructible object such as a ball, pipe or hard wood to the end of the chain may even reduce pig welfare. To test this hypothesis an expert survey was conducted. In total 36 international experts, mostly pig-welfare scientists, responded to the survey. Compared to the marginal enrichment provided before the EC Directive 2001/93 was implemented in 2007 (in the Netherlands generally a short/bare chain, scoring 3.1 and 3.3 respectively, i.e. Level 3-4), adding balls or pipe , as commonly done in The Netherlands and Germany, does not improve pig welfare. Hard wood, as practised esp. in the UK, is a most marginal improvement (only 0.4 higher on average than Bare chain). Chain on the floor scored a bit better (4.4), without being acceptable (set at 5.5). The ‘new’ Branched chains scored significantly better than all other indestructible materials and its welfare score (5.1 on average) was close to the pre-defined level of acceptability (5.5 on a scale from 0, worst, to 10, best). The welfare benefits of adding balls, pipes or hard wood to the metal chain were marginal, and well below what the experts considered acceptable enrichment. The branched-chains design, by contrast, appears to be the most viable alternative. It involves providing a longer chain, i.e. with the free end reaching to floor level, adding ‘branches’, i.e. several short chains ending at the nose height of the pigs, and providing more chains per pen (i.e. 1 branched chain per 5 pigs). Therefore, the implementation of current pig-enrichment legislation needs revision. Branched chains should be implemented widely (across the globe) and in the short term as a first step towards, and benchmark for, providing proper enrichment to intensively-farmed pigs. A collection of pictures of other enrichment materials for pigs can be found here: Prize contest (Prijsvraag) 2011. EC Directive 2001/93 requires that all pigs have access to proper investigation and manipulation materials. Intensively farmed pigs in Europe are frequently provided with a short metal chain with or without an indestructible object attached to the chain. To date authorities are regarding this as proper enrichment, perhaps with (in)direct reference to the RICHPIG model as a justification. However, it has become increasingly clear that the chains do not provide proper enrichment, and that adding an indestructible object to the end of the chain may even reduce rather than improve pig welfare. To test this hypothesis an expert survey was conducted containing 26 more or less compound questions. On a scale from 0 to 10 experts specified their level of agreement with the hypothesis, the prevalence and welfare scores of nine indestructible enrichment materials. In total 36 experts, mostly pig-welfare scientists, responded (response rate: 39%). Indestructible objects are less prevalent in countries that provide straw (like Sweden and the UK) and outside the EU (US). They are more prevalent in the Netherlands, Belgium, France and Finland, while the prevalence seems to be low in Spain. Balls, wood and pipes were provided most frequently: hard wood especially in the UK (as specified in farm assurance); indestructible balls and pipes in Germany and the Netherlands. The experts’ score for agreement with the hypothesis was only 4.6 on average (scale 0-10; n=25). Enrichment materials, ranked from high to low welfare score, were grouped in 5 significance levels as indicated by different superscripts based on Wilcoxon signed rank tests: Branched chains (5.1a), Chain on the floor (4.4b), Hard wood (3.7bc), Pipe (3.5c), Bare chain (3.3c), Short chain (3.1d), Small ball (2.8d), Big ball (2.5d), and Chain hanging too high (1.3e). Branched chains scored significantly better than all other indestructible materials and its welfare score (5.1 on average) was close to the pre-defined level of acceptability (5.5 on a scale from 0, worst, to 10, best). The welfare benefits of adding balls, pipes or hard wood to the metal chain were marginal, and well below what the experts considered acceptable enrichment. The branched-chains design, by contrast, appears to be the most viable alternative. It involves providing a longer chain, i.e. with the free end reaching to floor level, adding ‘branches’, i.e. several short chains ending at the nose height of the pigs, and providing more chains per pen (i.e. 1 branched chain per 5 pigs). Branched chains should be implemented widely and in the short term as a first step towards, and benchmark for, providing proper enrichment to intensively-farmed pigs. Two organic pigs interacting simultaneously with a branched chain in the snow. Despite access to a straw bed for rooting, even organic pigs may interact with such chains for long periods of time, esp. directed towards the floor. In fact they will root the chain on the floor more than twice as much as playing with it in a horizontal position. In intensive pig production chains are often (too) short, and when a hockey-type ball or ‘sustainable’ plastic pipe is attached to the end of such a chain the pigs’ interest, and their welfare, is often even reduced further. Two pigs playing simultaneously with a preferred anchor-type branched chain design. This post was published originally on the personal website of the first author (see here). Tail docking is an undesirable mutilation of pigs. Currently virtually all young piglets are docked in conventional farming so as to prevent tail biting later in life. However, throughout Europe efforts are made to reduce tail docking. Often farmers provide additional enrichment to try and prevent tail biting. Nevertheless, stopping the practice of tail docking may, and frequently does, lead to elevated levels of tail biting, resulting in tail wounds. In relation to this farmers and policy makers would like to know what levels of tail biting would be equivalent to tail docking in terms of pig welfare, i.e. how much tail biting can be allowed before deciding it would be better to continue tail docking. But this poses the problem how to weigh the (lack of) welfare involved in tail biting of a grower or finishing pig against the pain of tail docking of young piglets. Is this possible? And if so, how? We recently had a brainstorm session on this subject. This is an outline of what we came up with, including a very tentative personal estimate (by MB). In my personal view when (in the end up to) about 12% of undocked pigs were tail bitten that would be roughly equivalent in welfare to the docking of all piglets. The uncertainty margin, however, is high, at least ranging from 5-25%. The reasoning underlying my estimate is as follows. Firstly, piglets are normally docked using hot iron cautery. This is quite painful as it involves applying both heat and rather blunt trauma. The heat kills bacteria and thus may reduce the chance of subsequent infection of the tail wound. Tail biting at a later age, by contrast, is caused by even more (and multiple) blunt trauma (due to biting). It also has a substantially higher likelihood of infection. In addition, there is e.g. fear in the tail bitten pig due to being chased by a biter. Based on this I would say that pain (and stress directly related to tail biting) may roughly be about ten times as high in intensity and about ten times as long in duration, compared to tail docking. This would imply that 1 tail-bitten pig is off-set by about 100 docked piglets as regards the intensity and duration of the pain involved. However, animal welfare encompasses more than just pain. An important additional factor is the level of stress which is not directly related to tail biting activity. Firstly, there may be stress related to the treatment of tail biting, e.g. when biters and/or victims are taken out of the pen (resulting in social isolation and/or fighting). This stressor, however, is partly offset by the enhanced enrichment normally provided to pigs experiencing an outbreak of tail biting (though not all pigs are equally affected by the ‘costs’ and ‘benefits’). Note that there is another, more macabre, offset involving ‘happiness’ too, and that is the excitement experienced by the (sometimes fanatic) biter pigs when a tail-biting outbreak has started. Note also, that this biter ‘welfare’ is at the same time an indicator of the level of (background) stress experienced by pigs leading to this abnormal behaviour in the first place. A much more important source of stress that must be taken into account, therefore, is related to the general housing conditions to which the pigs are exposed prior to a tail biting outbreak. Tail biting is an unnatural behaviour that is triggered by (some kind of) stress. Pig farmers are aware of this and will try and prevent tail biting by generally improving the housing conditions when they (start to) raise pigs with intact (undocked) tails. Thus the expected level of stress to which the pigs are exposed is likely to be higher in the case of routine tail docking. When farmers stop tail docking they normally provide much better enrichment (rooting material & space). Farmers raising pigs with intact tails will also take other measures to reduce stress, e.g. provide better climatic conditions, better feed and better health care. These stress-reducing measures don’t just apply to the biters or the victims of tail biting. They apply to all pigs in the pen. Furthermore, they don’t just apply during an outbreak of tail biting, but they apply throughout the pigs’ lives. Hence, the reduced stress levels are a major factor reducing the off-set between docking and tail biting based exclusively on pain (and pain-related fear). I would estimate that the improved living conditions may reduce the off-set by at least a factor 10. This would mean that taking into account both pain and stress, 100(%) docked pigs (kept with minimal care and in a more barren environment) could be roughly equivalent to similarly-sized group of pigs with intact tails under enriched conditions and in which 10% of the pigs has been tail bitten. However, we know that tail biting does not only occur in undocked pigs. It is also seen in docked pigs. Roughly 2% of docked pigs are tail bitten. It seems safe to assume that the level of pain from being tail bitten is roughly comparable in docked pigs and in undocked pigs (though docked tails may be more sensitive and thus less likely to get bitten). Taking this into account would imply that 100 docked pigs of which 2% also experiences tail biting later in life would be having a level of (poor) welfare comparable to 100 undocked pigs of which 12% gets tail bitten. This is about 6 times as much tail biting as the 2% base-line set under conventional docking conditions. It must be emphasised again, however, that this level of 12% tail biting is a very rough estimate. So, a wide safety-margin applies, e.g. 5-25%. This may depend in particular on the quality of enrichment and the extra care provided under non-docking conditions. Please note, that this post is the result of a brainstorm session only and presents a personal view. It illustrates how systematic reasoning (using principles of semantic modelling) can be used to start to answer this rather important welfare question. I have provided a very rough estimate. For a more accurate assessment more detailed studies would certainly be required, both in terms of more carefully including what is already known and in terms of accumulating more empirical knowledge about what is not known yet. At present the assessment is still very speculative, and meant to illustrate primarily how to in principle deal with the question of what level of tail biting is equivalent to a practice of routine tail docking. Note that, in my estimate I neglected several (minor) aspects. Firstly, I neglected the fact that for tail docking piglets must be picked up. This results in stress, both in the mother sow and in the piglets. 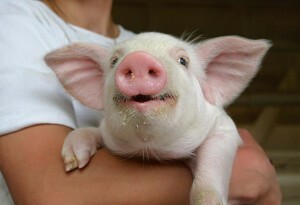 From an evolutionary perspective the procedure of catching piglets may be equivalent to experiencing capture by a predator. This would mean that the given estimate would be a moderate underestimation. However, tail docking may be performed in combination with other treatments such as iron injection and castration. If so, the additional stress from handling may be relatively minor. Note, however, that castration applies only to males and may be banned in the near future, and iron injection may be given orally as a kind of ingestible compost, or as has recently been shown, may not be necessary at all. Hence, combining such treatments with tail docking has a reducing likelihood. Secondly, I assumed that teeth cutting will not be practiced to treat an outbreak of tail biting, neither in the docked pigs, nor in the undocked pigs. Or, more precisely, at least I assumed teeth cutting is not practiced in substantially different numbers of pig. Such teeth cutting is painful and illegal, so it could be considered appropriate to ignore the practice. However, if it were practiced more in undocked pigs (which are likely to experience higher levels of tail biting), then it would have a substantial impact on the level of equivalence, pushing the percentage back down again substantially. A third point to note is that I did not include in the estimate other ethical considerations or our (anthropomorphic) emotional responses. An example of the latter may be related to the amount of blood seen in the pen, the farmer’s level of stress (unpredictability) associated to this, and the potentially adverse economic consequences associated with tail biting. An example of other ethical considerations is the fact that tail docking may be considered to be an infringement of the animals’ integrity or intrinsic value. In such a rights-based moral view tail docking may be considered ethically wrong, regardless of the level of tail biting when tail docking is stopped. Such aspects were excluded because these are aspects not directly related to animal welfare. They are more related to our human perception of ethics and/or human welfare, rather than animal welfare. Finally, it is most important to emphasise that I have considered steady-state conditions, but realize that all practices are subject to optimisation. The practice of tail docking has already been optimised for over a period of at least 50 year. By contrast, the practice of raising pigs with intact tails still more or less has to enter the phase of optimisation in commercial practice. This implies that substantially higher levels of tail biting may be regarded as acceptable, provided this is only temporary and provided it leads to substantially lower levels of tail biting later on. In other words, it requires that farmers will persist in raising pigs with intact tails and have a chance to learn to deal with it over a certain transition period, both in terms of prevention and treatment of tail-biting outbreaks. Regarding the painfulness of tail biting vs tail docking, I find it impossible to guess the relation – especially as tail biting comes in so many forms. I absolutely agree that a weighing like this is necessary, but I also think it is a bit dangerous to throw out estimates that are not really based on any evidence (or at least you do not present any? ), such as the 100 times worse pain experienced by bitten pigs than docked pigs. Also, tail biting is very heterogeneous, from just a small, one-time bite, to a chronic situation, where the entire tail is lost, so the way you estimate the pain simplifies the matter greatly. As to the expected level of actual tail biting when docking is stopped: I estimate a two-fold increase in tail biting if no docking is performed. Perhaps somewhere between 2- and 4-fold, based on e.g. slaughterhouse data. There may be a 4-fold increase when the housing situation is not improved otherwise – which you also take into account in your text – when applying a non-docking policy the farmer would normally also improve housing conditions, thus reducing the risk further. I certainly agree that when a farm stops docking, they will probably have a higher incidence of tail biting initially, but on the long-term (as is shown e.g. in Finland where tail docking is totally forbidden, and the tail-biting incidence, based on abattoir data is around 2%), a 10 or 12% incidence is certainly higher than I would expect. Having read your blog I think you need to factor in adaptive, compensatory pain modulation into your model. It is sometimes too easy to fail to take into account post-injury peripheral and central modulation of pain signalling that occur as part of the normal healing process and only focus on the ‘pro-pain’ component. I also don’t see how you can substantiate this claim? ‘Based on this I would say that the pain of tail biting may be about ten times as high and about ten times as long, compared to tail docking. This would imply that 1 tail-bitten pig is off-set by about 100 docked piglets as regards the intensity and duration of the pain involved’. While I think it might be possible to attribute weighting to some risk factors within systems, I don’t think it can be applied to pain experienced by an individual (or even at group level as you are suggesting) because there are so many factors that contribute to an individual’s experience of pain? I don’t think you can quantify the painfulness of tail biting and tail docking. Also when thinking about stress you might want to define what you mean by that in relation to chronicity? Short-term compensatory responses to stress are in my view positive for the animal; however beyond that when there is a failure of compensation and ultimately homeostatic decompensation then they are undoubtedly negative. I hope you find my comments helpful? As to substantiation, again, it’s my suggestion for a start of an argument to answer this in my view fairly important question. My answer is based on my personal experience as a vet and scientist, and on reasons indicated in the blog. It is certainly in need of further study, examination and assessment. I fully acknowledge the considerable level of uncertainty as well as the risk associated with trying to answer the question. At the same time, however, I would also argue that there is a considerable risk in refusing to try to answer the question, as this leaves the issue to stakeholders. Joining the discussion rather late, but basically I agree with the points others have made. I think it quite reasonable to conceptually set out the trade-offs which would determine the level of tail biting above which tail docking could be ethically justified, but putting numbers on some of these things is rather difficult. For risk of tail biting in docked and undocked pigs we have a growing number of published sources and comparative national data. For experimental comparisons we have old data suggesting increases of 30-60% in pigs in unbedded systems. More recently we have studies suggesting somewhat lower results if straw is given. So this part is perhaps simple, but depends on your assumptions about which husbandry systems will pertain across Europe. For the welfare detriment of tail docking and tail biting, data indicate that both have long lasting effects on pain processing pathways, but the implications of this for pain perception for the individual are uncertain. For tail docking, the data I have seen are still contradictory on whether cautery is more or less painful than simple section (some suggest the cautery destroys the nerves whilst others suggest greater pain). There is also the possibility of tail docking with anaesthesia/analgesia as a route of adoption. For tail biting, the short term pain will certainly depend on the severity and, even more, on the prevalence of infection. The data on this are currently lacking to my knowledge. The welfare impairment of keeping in conditions which give rise to tail biting is clearly the greatest of all in magnitude (severity x duration x no of animals) but I don’t think we have any way of comparing the welfare severity of ‘behavioural frustration’ against that of injury/pain. I would be concerned about taking arbitrary figures in the absence of any logical basis. So, I guess my suggestion would be to explore the framework for this decision, but be very wary about pretending we can quantify it. I also think the issue not addressed in your blog is the time course of any transition to cessation of tail docking and how to manage this. What proportion of farmers would have the awareness, capital and staff training to implement the changes necessary to their existing housing if obliged to cease tail docking (some older, fully slatted and large group housing systems will pose much bigger challenges and possibly require replacement of buildings), and how long would it take across Europe to reach the ‘acceptable’ situation of relatively low differential in tail-biting prevalence between docked and intact tails, rather than the ‘unacceptable’ differential shown for “one off” change in tail-docking experiments (stopping docking without further improvement of the environmental conditions). I think it important to highlight that your analysis relates to a ‘steady state’ situation and the importance of how any transition is managed and the welfare implications which this will have. Note that I have not been comparing docking versus non-docking in a mono-factorial way. I compared docking in a more barren environment versus not docking in a more enriched environment supplemented with special attention by the farmer, as that is what will normally happen in practice. I have now emphasised this more clearly in the text. I largely agree that we currently largely lack the data needed to quantify more precisely. However, I also believe that in principle it is possible to do so, and that the estimate/assessment can be more or less verified empirically (as the body of knowledge accumulates and modelling principles are improved). Personally, I am inclined to try and quantify despite considerable uncertainty, because it provides a better starting point for further discussion. In addition, such preliminary but more science-based estimates are much needed to complement the inevitably politically-loaded figures and personal assessments presented by farmer-representatives and NGO’s arguing either (rather exclusively) against or in favour of ending tail docking as a routine practice to prevent tail biting. An important point I’ve been trying to make is that pain is not the only relevant aspect of welfare involved in tail docking and tail biting, and that the levels of enrichment and care should also be taken into account. I don’t think it is even possible to honestly say it is not possible to ‘add’ these aspects, since proper political decision making (in all kinds of areas, not just tail biting) simply does and has to, whether it is considered scientifically possible or not. And if so, I would argue it is most reasonable to try and provide the best possible scientific support, while being as honest as possible e.g. about uncertainty margins and the relevance of incorporating more information. I also think the estimate provides broad support to ‘farewell-dock’ initiatives such as those in Finland, Sweden, Denmark, the Netherlands, the UK and Germany. A new report provides evidence that there are solutions to counter the commonly held belief that rearing pigs and avoiding tail docking is impossible. 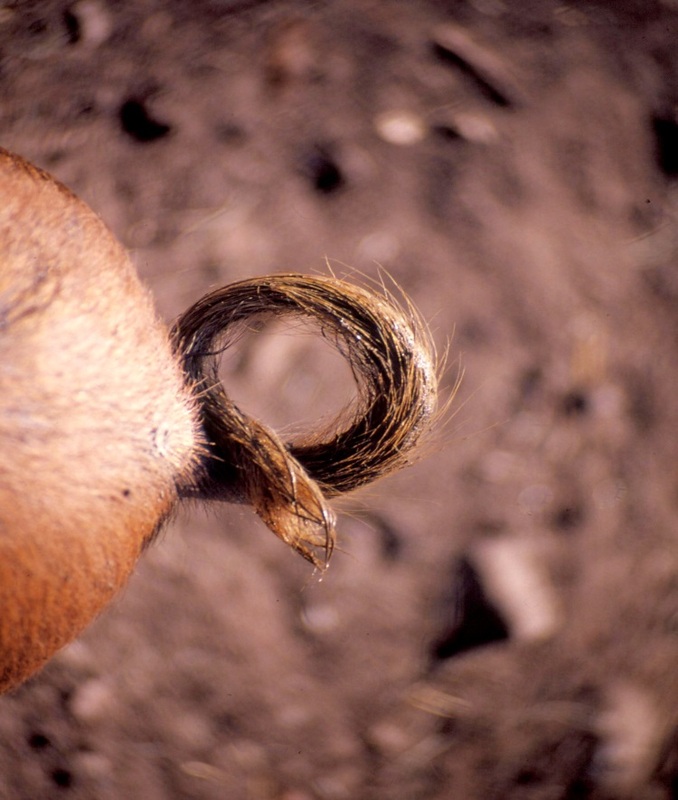 Based on visits to three countries where tail docking is not performed routinely, it summarises good practices to rear pigs with intact tails. It finds that the key to do so is to lower stress levels through active management of enrichment materials; feed and air quality; reduction of competition between animals; and good animal health status. Another key factor to ensure intact tails is that farmers rapidly identify tail biters and remove them to prevent the escalation of tail biting. Note: The presentations of the meeting can be accessed here. The video recordings will be available for some time after the meeting via this link. The European Commission Directorate General for Health and Food Safety is organising a three day meeting at the offices of its Health and Food Audit and Analysis Directorate in Ireland on actions to prevent tailbiting and reduce tail docking of pigs. The programme includes a wide range of relevant topics. It is delivered by experts from industry, Member State Competent Authorities, research bodies, EU institutions and NGOs. Case studies will facilitate the exchange of good practice and workshops will focus on better solutions for the future. The work of the EU FareWellDock project will also be presented at this meeting. The meeting is aimed at the authorities of Member States, international organizations, scientists, industry and NGOs. The Agenda can be found below. 4 October: 14:00- 16:45 GMT. 5 October: 09:00- 16:30 GMT. Please send any questions you may have on the presentations to the functional mailbox: SANTE-IRL-WEBINAR-REARING-PIGS-WITH-INTACT-TAILS@ec.europa.eu and we will endeavour to answer as many as we can during the time for questions at the end of each presentation. If we cannot answer your question during the webinar, we will forward your question to the presenter for response after the event. * Please note that proceedings from this meeting, apart from breakout groups, will be broadcast live on the Internet. Bracke, M.B.M. 2016. Enrichment materials for intensively-farmed pigs – From review to preview (Conference abstract & presentation, ICPD 2016). In: Kemp, B. et al., 2016. 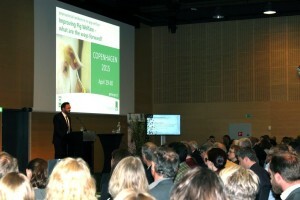 16th International Conference on Production Diseases in Farm Animals. June 20-23, 2016. Wageningen, NL. p. 179. Tail biting is a well-known production disease in intensively-farmed pigs raising concern for animal welfare, e.g. related to the practice of routine tail docking. To reduce tail biting pigs are provided with enrichment materials. EU legislation requires that pigs have permanent access to a sufficient quantity of material to enable proper investigation and manipulation activities. 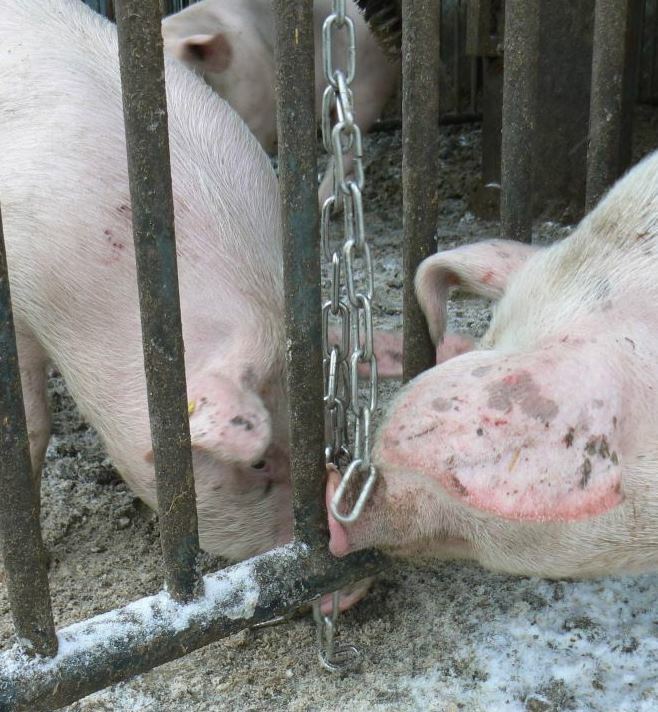 In order to meet this directive many pigs are provided with a metal chain with or without a rather indestructible object attached to the chain. The European commission recently revised current guidelines as to what constitutes adequate enrichment, apparently moving into the direction of the status-quo in welfare schemes. Building on extensive previous work at Wageningen UR Livestock Research, especially on the modelling of pig enrichment (the so-called RICHPIG model) a review is presented of our current state of knowledge. In addition, an outline is given as to how so-called AMI-sensors, measuring Animal-Material Interactions (AMI) (semi-)automatically, can be used to assess the pig’s need for enrichment, also in relation to aspects associated with health status, such as feed restriction, biting wounds and streptococcus infection. It is suggested that the use of chains with or without rather indestructible materials such as pipes, balls or (hard)wood is generally inadequate to enrich the pens of intensively-farmed pigs. An evolutionary mechanism appears to be underlying the causation of multifactorial welfare problems in general, the issues of enrichment, tail biting and tail docking in pigs in particular. In this respect ongoing selection for increased resource efficiency has been exerting a profound impact on livestock production. Various routes are explored as to how persistent welfare problems may be resolved, including a method that has been called Intelligent Natural Design (IND). Two organic pigs interacting simultaneously with a branched chain in the snow. Despite access to a straw bed for rooting, even organic pigs may interact with such chains for long periods of time, esp. directed towards the floor. In fact they will root the chain on the floor more than twice as much as playing with it in a horizontal position. In intensive pig production chains are often (too) short, and when a hockey-type ball or ‘sustainable’ plastic pipe is attached to the end of such a chain the pigs’ interest, and their welfare, is often even reduced further. By contrast, to improve the chain further 7mm stainless-steel anchor chains may be recommended for growing pigs over the cheaper c-chain shown here, as anchor chains have heavier and more rounded shackles. See also an older previous presentation on tail biting. Bracke, M.B.M, Wolthuis, M., Zonderland, J. J., Kluivers, M., 2011. TAILS TO TELL – Tail docking, tail biting and enrichment for pigs – Experiences from the Netherlands. Herning, DK, May 25-26, 2011. By Lerner, H and B. Algers. 2013. In book: The ethics of consumption, pp.374-378. Wageningen Academic Publishers. The Netherlands. The question of tail docking in pigs is an ongoing problem despite the fact that it should have been solved long ago. In the Council Directive 2008/120/EC it is clearly stated that routine tail docking in pigs are prohibited and enrichment materials for the pigs must be provided, which is in line with the high animal welfare standards that the European Union aim for. This directive is in force in all member states. The habit of tail docking is widespread as a simple comparison by two reports by EFSA shows. We present these results together with results showing that some countries, like Sweden, Finland and Lithuania manage to still keep their production without tail docking routinely. We therefore suggest that the gap between the strong intentions of prohibiting tail docking in the directive and the weak (or non-existent) enforcement of it in most countries in the EU needs to be closed. Of the arguments saying that this will be a troublesome task, we will here focus on two of them. The first is that the directive is unclear or actually allows tail docking. The second is that the habit of routine tail docking is economically profitable. Both these arguments will not hold. There are three ways to bridge the gap. The first is to lower the threshold, lowering the animal welfare level in the directive. We believe strongly that this solution is contradictory to the trend in today’s legislation about animals and not in line with the Lisbon treaty. The second is to demand stronger enforcement which is in line with the EU Strategy for the Protection and Welfare of Animals 2012-2015. The third is to accept that different countries will not enforce the directive, then leaving it to the consumer to choose between more or less animal friendly pork. EU seems to adopt this way in contrast to the EU AW Strategy. To properly inform consumers about animal welfare is a good help although it demands a lot of resources and is a rather slow process. Therefore, in order to have a rapid solution to the gap one need to have a stronger enforcement of the law. March 2016 the European Commission takes another step to reduce tail docking and improve enrichment for pigs as part of its animal welfare strategy. The welfare of pigs is assured by Council Directive 2008/120/EC. COMMISSION RECOMMENDATION (EU) 2016/336 of 8 March 2016 on the application of Council Directive 2008/120/EC laying down minimum standards for the protection of pigs as regards measures to reduce the need for tail-docking. STAFF WORKING DOCUMENT (706 kB) on best practices with a view to the prevention of routine tail-docking and the provision of enrichment materials to pigs [SWD(2016)49 final] Following the adoption of the Commission Recommendation (EU) 2016/336 as regards measures to reduce the need for tail-docking, the staff working document provides useful tools to a harmonised understanding on how the provision of manipulable material and avoidance of tail-docking can be practically achieved. The working document recognises that proper enrichment is important to help prevent tail biting, and hence the need for tail docking. Specified as unsafe are synthetic ropes, tyres, dry wood, dry sawdust, poorly stored straw, untreated peat/mushroom compost and dirty objects. fulfiling the essential needs of the pigs. Other materials should also be provided. Materials of marginal interest include objects, such as hard plastic piping or chains. Marginal materials may supplement suboptimal materials like stones or strawdust briquette. This first week of February 2016 two items related to tail biting appeared in farmers’ press in The Netherlands. In addition, we recently provided input into a European project on the welfare of poultry, which will be reported on briefly below. One news item announced that farmers are invited at the Intensive Farming Fair in Venray (LIV Venray), March 1-3 2016. At the fair two finished tail-biting projects will be presented and discussed with entrepreneurs who are active in intensive farming. One of the projects is ‘Keeping pigs with intact tails’. The other item was a report on the German tail biting (Ringelschwanz-)project. First results of the curly-tail project in North-Rhine Westphalia showed that more than one quarter of piglets at 15 participating research farms had damaged tails before the end of the rearing period. At some farms half of the tails had been bitten. At the 15 farms participating in the study 30-94 piglets had been reared on each farm without tail docking. Outbreaks of tail biting appeared to be associated with streptococcus infections. Prevention and intervention strategies included providing dried maize silage or alfalfa hay twice daily and the isolation of biters respectively. Most tail biting occurred between week 2 and 4 after weaning. This level of tail biting is not so good news. If these levels of tail biting would persist, it may indicate that intensive systems cannot be made compatible with acceptable levels of animal welfare. Fortunately, however, experiences in Finland indicate that it should be possible to keep undocked pigs in conventional systems at much lower levels of tail biting (around 2% based on slaughter house data). The German farmers union and North-Rhine Westphalia have agreed 1.5 years ago that they intend to stop tail docking by 2017. This will be done provided on-farm research shows that tail biting among pigs with intact tails does not reduce animal welfare. The general expectation is that the objective of safely quitting tail docking cannot be met. The first is that our semantic-modelling approach provides a unique methodology to determine/assess the cut-off point between the welfare impacts of tail biting and tail docking using formalised biological reasoning and scientific evidence. In this computation one must take into account all relevant aspects: So, not only the point that the welfare of tail bitten pigs is reduced due to blunt trauma (biting) compared to the sharp trauma of tail docking at an earlier age. But also the point must be recognised that the welfare of tail biting pigs may relatively be improved when they can bite their penmates’ tails, compared to when they cannot (other things being equal, i.e. lack of suitable enrichment). What matters for welfare as considered from the animals’ point of view is the extent to which they can satisfy their needs, e.g. for biting and the expression of species-specific foraging behaviour, taking into account also the activation of coping mechanisms such as redirected and harmful-social behaviours. The second thing to note about the results of the German research project is the following. In addition to taking note of the bad news (many bitten tails, which has to be taken seriously, perhaps even to the point that the conclusion must be drawn that intensive systems are not compatible with acceptable animal welfare), one may also try to move forwards for the time being by focussing on the good news: Two out of the 15 pilot farms in Germany managed to keep all piglets’ tails intact. Other farms may learn from what was done on these farms to keep tails intact. Furthermore, since the EC Directive requires that all farms try to periodically keep at least some intact pigs, a 10% success rate could provide sufficient scope for progress at the population level, even when the causes of the success are poorly understood. This can be concluded from a methodology we designed previously to solve complex welfare problems like feather pecking in poultry and tail biting in pigs. This methodology has been called ‘Intelligent Natural Design’ (INO in Dutch; see also Bracke, 2010). It basically uses evolution to select the best farms to make increasing progress towards the objective of completely stopping the practice of routine tail docking in pig farming. Countering the routine practices of tail docking and beak trimming, as well as preventing and treating outbreaks of tail biting and feather pecking requires an understanding of tipping points. Recently, we modified our tipping-bucket model for tail biting for inclusion on the Henhub website. This website, which is part of the Hennovation project, gives information about welfare issues in poultry, esp. (at present) feather pecking. 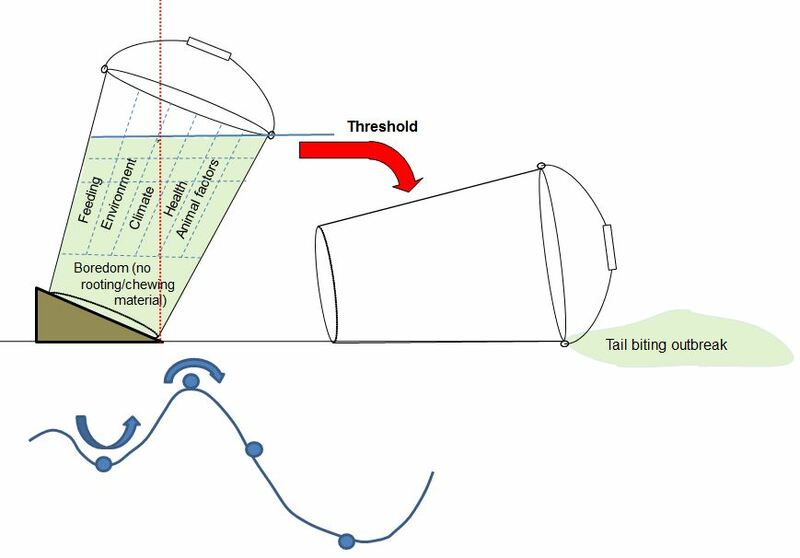 On that site the modified tipping-bucket model can be found under the post describing the mechanism of feather pecking. Bracke, M.B.M. 2010. Towards long(er) pig tails: New strategy to solve animal welfare problems. In: Lidfors, L., Blokhuis, H., Keeling, L., Proceedings of the 44th Congress of the ISAE, August 4-7 2010, Wageningen Academic Publishers, Wageningen, p. 135. (Poster, ISAE 2010, Uppsala, Sweden, Aug 4-7. The German Federal Research Institute for Animal Health (FLI) has reviewed current research on tail biting in pigs. The report entitled “Übersicht über Untersuchungen zum Themenkomplex „Schwanzbeißen” makes specific recommendations as to how to best tackle the tail biting problem. The report also has an extensive appendix (under ‘documents’) listing projects, main project results and references on tail biting. Twenty-six different research projects were counted in Germany alone. Many other projects were also listed in other EU countries (The Netherlands, Belgium, UK, Ireland, Denmark, Finland, Sweden, Norway, Spain and Hungary). Also the EFSA and FareWellDock activities were noted, as well as the International Pig Welfare Conference in Denmark in April 2015 (see our Soundbite posts 1, 2, 3, 4 and 5). The report has a detailed list of recommendations split for the farm and regional level. At farm level risk assessment, gradual reduction of tail docking, networking, demonstration farms, and trying-out of practical solutions to prevent and treat tail biting are mentioned. At the regional and national level the report mentions the collection and distribution of knowledge in various ways, the coordination of activities, the building of networks of tail biting experts, education/training, the installation of an information platform and the support of research projects using standardised protocol and cooperation with other EU countries. The report noted a trend for tail biting to start at rather earlier ages (shortly after weaning, but also even before weaning, as has previously been observed by Dr. Ursinus). It was also noted that on average 70% of the pigs used in the 26 research and field projects in Germany had severe tail lesions. Since these projects were focussing on (improvements of) current housing conditions, it may be questioned whether and to what extent current systems are suited to finally succeed in stopping completely the current practice of tail docking. On 29 – 30 April 2015 Danish Minister for Food, Agriculture and Fisheries, Dan Jørgensen hosted an international conference “Improving Pig Welfare – what are the ways forward?“. During the two-day conference, top academics, experts and political stakeholders from around the world debated and worked to prepare the way forward in improving pig welfare in Europe and ultimately in the world. Ministers from the Netherlands, Germany and Sweden participated. Below you find ‘soundbites’ from the conference, all more or less related to the subjects of study in the FareWellDock project. This is part 1. Parts 2-5 are other blog posts on this website. 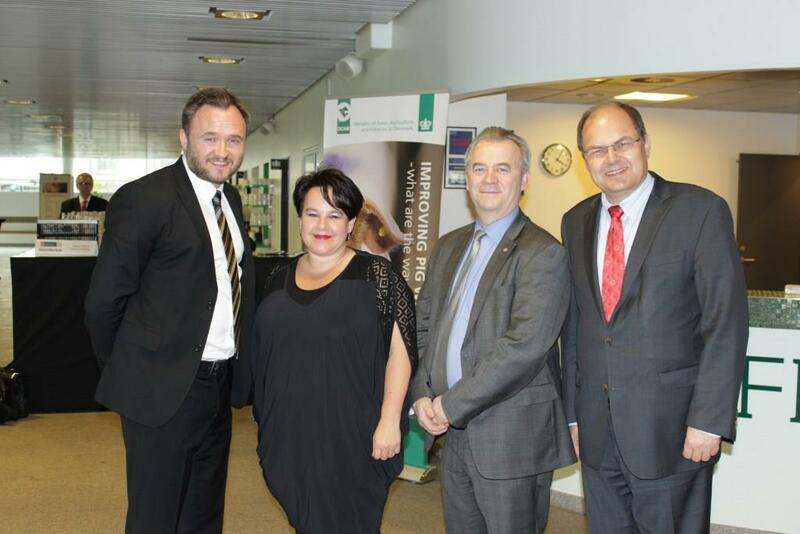 Left to right: Dan Jørgensen, Minister for Food, Agriculture and Fisheries, DK. Sharon Dijksma, Minister for Agriculture, NL. Sven-Erik Bucht, Minister for Rural Affairs, SE. Christian Schmidt, Federal Minister of Food and Agriculture, DE.